A couple of months back, an unusual sighting caught the attention of the general public. People were intrigued and at the same time scared of what was happening above their heads. On November 7, 2015, a huge ball of light perturbed the silence of the night. Concerned about a nuclear attack, the citizens gathered outside to watch the spectacle. While this can be taken as a mere missile launch, the events that followed might prove otherwise. We’ve seen the missile launches this autumn and they all had a thing in common – a scheduled launch date available prior to the launching of the missile. However, in this particular case there were no information available. Could this be a secret Navy project, or could the luminous object be something completely different? Apart from this missile-or-not enigma, there is something else going on, I’d say of greater importance. After a while, another smaller UFO enters the scene only to cause havoc. The sneeky flying device passes close to the other object, and after a few moments the presumed missile blows up without making any noise whatsoever. It leaves behind a blue trail while also gaining a radiant whitish aura. After many people reported this “unscheduled event”, the Navy came with a reasoning explanation: the launch of a Trident missile (without the nuclear load obviously). However, there was no official report regarding the mysterious UFO that appears to have caused the explosion. Can we trust the Navy? Or is it only a cover-up of a greater event? After analyzing the bizarre occurence, we’ve found a few similarities between the luminous object and a test missile, however, there are too many thing that do not add up. 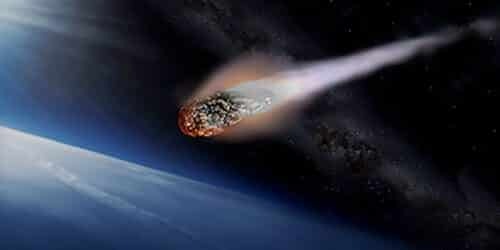 Some analysts believe that what we saw in the sky was in fact a meteor blown up by a mysterious UFO of either human or alien origins. Do you think aliens might try to prevent a nuclear disaster? Or is this some kind of secret Navy program meant for testing their “otherworldly toys”? Whatever the case, the video will speak for itself. What do you think? This other video shows a close-up of the events.